Garden Grove Engine Service and Diagnostic - Morrison Tire Inc.
At Morrison Tire, our Garden Grove team can use you vehicles on-board computer, interpret information, and advise you the best route to fixing your problem. We stand behind our experience, equipment, and parts by providing a 2 year 24,000 mile warranty on most parts and labor. We make it our goal to never guess, provide a comprehensive estimate without tacking on unnecessary components, and shoot for a timely repair. These features make us your dealership alternative in the Garden Grove, Cypress, and Seal Beach area. Keeping your engine properly maintained beyond a basic oil and filter change allows the driver to get maximum performance out of their engine. At Morrison Tire, we have the ability for spark plug and wire replacement, fuel injection cleaning and service, throttle body and mass air flow sensor cleaning, fuel filter replacement, and even more! Contact us today to see what your vehicle and engine requires to keep it up to snuff! We make it our mission to serve the Garden Grove community. This includes helping surrounding shops. 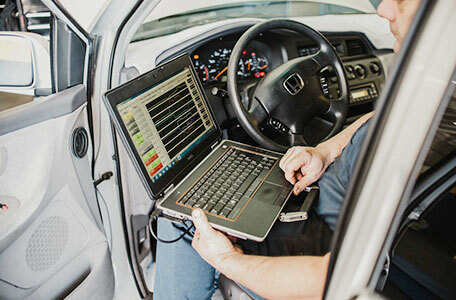 If you are a technician or service center that is struggling with a particular diagnosis or need vehicle reprogramming, we can help. We have in house programming for most domestic and Asian vehicles and have access to means for other vehicles and offer our services at a wholesale rate. No need to shell out retail prices to a dealer for a second opinion. Call us today and we can help get your customers back on the road.